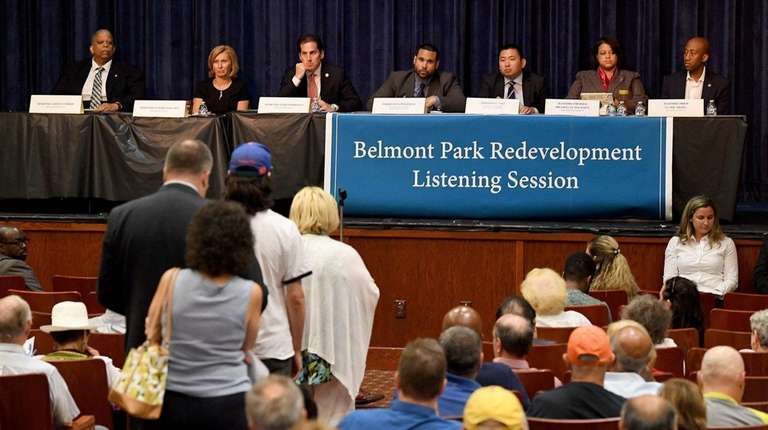 More than 300 Nassau residents, including dozens of New York Islanders’ fans, packed the Elmont Library Monday for a hearing on plans to redevelop Belmont Park, including potentially a new arena for the hockey team. Empire State Development, the state’s primary business development agency, plans to issue a Request for Proposals to develop the state-run property. NHL Commissioner Gary Bettman has said the Islanders, who play at Brooklyn’s Barclays Center, will bid on the 28-acre property. Sources say there are already well-developed arena renderings in place in preparation for their bid. More than 50 area residents testified about their goals for the redevelopment, including high paying jobs, additional green space and a year-round Long Island Rail Road station. But the hearing, sponsored by state lawmakers, focused largely on the prospects of a new hockey arena for the Islanders, with area residents generally split on the idea. Joseph Jarzynka of Bellerose said Long Islanders do not want to travel to Brooklyn to attend games, particularly on week nights. “Cutting down the commute time and cost will surely draw more fans,” he said. Bruce Schneider of Elmont also argued for an arena, citing the prospects of increased tax revenue for the community and jobs for local residents. “We need people who are vendors; people who are ushers; people who are security staff,” Schneider said. But Matthew Sexton of Floral Park echoed a common concern among residents that the arena would bring only minimum wage positions to the area. “Arenas are net economic losers for the community,” said Sexton as boos reigned down from Islanders’ fans, who wore jerseys, hats and carried signs in support of an arena. The Islanders averaged 13,000 fans at Barclays this season, second lowest in the NHL, and the team has been unhappy with the quality of the ice, the marketing of the team and the atmosphere for fans. The Islanders or Barclays can opt out of their 25-year licensing agreement in January. The Islanders are being advised by the Oak View Group, a company backed by Madison Square Garden that develops, manages and provides content for sports arena nationwide. Sources say the Islanders and Oak View have been engaged over the last year in discussions with the Wilpon family, the majority owners of the Mets, about being involved in the Belmont arena. Officials with the Islanders, NHL and Barclays Center all declined to comment on the hearing. Last year, ESD scrapped proposals, including a 25,000-seat soccer stadium for the New York Cosmos, after a four-year process. Elmont residents also successfully rallied against plans last year to put a video lottery casino at Belmont.